When we visit EA's parents in Nashville, I will often go for a run down Belmont Blvd, towards the campus of Vanderbilt, and then back. There is this bus stop bench that I pass on the way back a couple of miles from my in-laws' home. 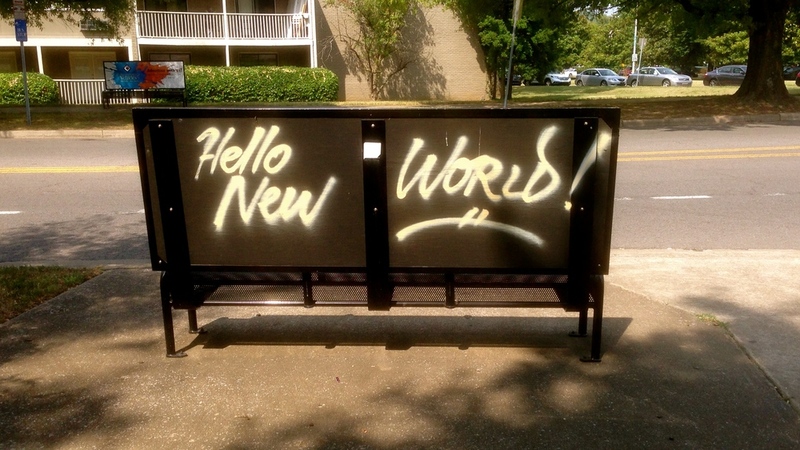 On the back, someone spray painted the message "Hello New World!" I've tried to imagine what circumstance birthed such an ecstatically hopeful message. It had to be in celebration of something. I often wonder if it was created the night when Barack Obama was elected as our nation's first African-American president. Or perhaps the messenger had just fallen in love, witnessed the birth of a child, gotten a job, decided to find sobriety, or experienced something else so joyful that they had to express it. I have also wondered if this person decorated the bus stop on an ordinary Tuesday. They had no particular reason to celebrate other than the fact that it was a new day. I kind of want that theory to be true. It demonstrates such courageous hope because it is terribly easy to be terrified of the newness the day brings. The sentiment would be especially understandable of late. The Middle East daily brings stories of children lost in the bloody machinery of war, terrorists seeking to exterminate religious minorities, and people on both sides of conflict yearning for peace but finding only violence. The Ebola outbreak in western Africa has claimed the lives of over a thousand people and has thousands more living in fear. In Missouri, an unarmed African-American teenager was shot and killed by police; tearing open the wounds of racism and causing tense unrest. Yesterday, Robin Williams, an actor beloved by many, committed suicide after struggling with severe depression. When a loss of that nature plays out on the national scale, it can be especially painful for those that have similarly lost loved ones. It would be understandable if a person took stock of the potential hell that lurks in a new day and spray painted "Stay Away New World!" Yesterday may have had its terror, but at least we know what it is. Yet that was not the attitude of this messenger. She or he looked at a world rife with danger and welcomed it with open arms. People might say that this hope foolish and naive. Perhaps it is. Yet it is also incredibly brave. We live in a world that needs it, because terrible things are going to happen today. If we live in fear or if we are cynical that nothing is ever going to change then it is only going to feed the beast. We have to remember that good things can happen today too. And while we acknowledge the evil in this world and do what we can to turn back the tide, we hope. Lamentations is a mournful meditation on a world that batters, bruises, and kills. As the title suggests, it is a book-long lament over an immense tragedy. Yet even in that darkness, there is a sliver of light. With each new world we face, God's love and mercy is there too. As Christians, we are called to be lights in this world. That does not just mean telling people about Jesus. That means being signs of hope in a dark world. This does not mean that we plaster on fake smiles and pretend like everything is fine. But we are supposed to be hope in what we say and do. Even when the new world may seem like hell, the hope we live out should point to God's kingdom come. We must be bearers of hope. And when there are those inevitable days when we cannot hope? May others come around us, care for us, and hope for us. After all, hope is a celebration and a celebration is best shared with others. I wish I knew who sprayed that message on that bus stop bench in Nashville. I would like to thank that person because I love that sign. It encourages me each time that I see it. It reminds me that despite the world's cruelty, goodness is there too. And even though it would sound completely crazy, I would tell the messenger that I want to be like that bus stop. But a sign of hope.